Table salt, stripped of minerals and bleached, is a freak of nature. Your body sees it that way, too. Sea salts, unfortunately, are becoming more and more polluted as the oceans fill up with toxins. Real Salt, mined from ancient sea beds, is untainted by toxins and provides a rich source of 60+ trace minerals. Himalayan salt is also mined from ancient sea beds, so it is pure from modern environmental toxins. It provides a whopping 84 trace minerals, plus a unique ionic energy that is released when the salt is mixed with water. UPDATE: As it turns out, Real Salt, Celtic Salt, and Himalayan Salt share the same number and type of minerals. The “84 minerals” in himalayan salt is an unsupported claim. I had the opportunity to speak with a salt expert and I shared how unrefined salts compare, as well as concerns about contaminants in the salt. Since discovering sole, I start my day with a teaspoon of this powerfully detoxing and rejuvenating elixir. Because it requires only himalayan salt (or Real Salt), water, and a jar, this health treatment is accessible and affordable for everyone. In the morning, take 1 tsp. of sole, mixed into some room temperature water, upon waking. Never use metal utensils with your sole! The reason for [not using metal lids/utensils with sole] is that salt when mixed with water can (and will) oxidize metals. It is the same reason that salt on the roads will rust your car. Dry salt can sit on dry metal without it causing a chemical reaction – however when you add water to the equation everything changes and the chemical and physical reactions start to take place. When this happens it can release other metals and chemicals into the salt water as the metal lid (or metal spoon) starts to corrode. Even if they are stainless steel or other non-corrosive metals that won’t rust in theory, they can still react to the salt water. Now that said, using a metal spoon to scoop water out a little water or to quickly stir the solution probably won’t be in contact with the salt water to start the reaction, so I would not worry too much about that few seconds. I do that myself without worry. Leaving the metal spoon in the salt water, or using metal canning jar lid that is in contact with the salt water for longer periods really increases the potential of having oxidization and corrosion issues by drawing chemicals/metals/elements out of the metal and into the water. Spelotherapy, also called salt therapy, utilizes salt to address respiratory diseases and improve overall health. Although little known in the U.S., it is widespread in Europe. Since the 1800s, many people visit European salt mines to breathe in the salt-rich air. One modern form of salt therapy consists of sitting in a room pumped with salt-laden air. Additionally, although I didn’t see it mentioned in a study, but many people testify that salt therapy drastically improves snoring. To use salt therapy at home, you’ll need a Himalayan Salt Inhaler. (This is a cheaper option but I haven’t tried it.) This is a porcelain jar with a spout. It comes with himalayan salt, and you put this in the base of the inhaler. Then, put your mouth over the spout and inhale the purifying salt air. Exhale through your nose. Do this for at least 10-15 minutes per day (you can do it in 5 minute intervals). It’s easy to do while you watch TV. You can use himalayan salt or Real Salt in a salt inhaler. I recommend watching this quick video to learn how to use a salt inhaler. When I first discovered the health benefits of himalayan salt lamps, I eagerly purchased my first lamp. Salt lamps make a beautiful, affordable and healthy addition to any room. Himalayan salt lamps are most applauded for their air purifying properties. How do the lamps purify the air? Salt lamps attract moisture from the air to the lamp surface, where, due to the warmth, the water evaporates quickly. The evaporation produces negative ions (source). Pollen, dust, dirt, pollutants, and allergens in the air all carry a positive charge, and that is how they can be suspended in the air. The negative ions neutralize these positive ions so they can no longer be airborne. Due to the negative ion production, salt lamps are believed to reduce the toxicity of EMFs. EMFs are the electromagnetic frequencies emitted from electronics. Growing research shows that the high levels of EMFs in our living environment contribute to disease. 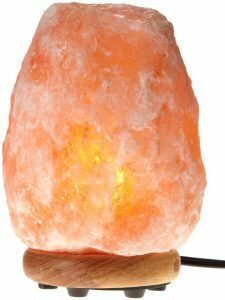 You can purchase salt lamps that plug into your computers USB port to help reduce the electropollution and radiation from the computer. You’ll find himalayan salt lamps here on Amazon (the 8″ size, my favorite size, is 50% off!). Many readers tell me they also find the lamps from wellness catalogs or health food stores. For best results, leave your lamp on 24/7. The lamp itself lasts indefinitely, but the bulb will need to be occasionally replaced. I purchase replacement bulbs – which are just oven/microwave light bulbs – at my local home improvement store. Flushing your sinuses with warm salt water… oh boy, doesn’t that sound appealing? Ick factor aside, nasal irrigation with a neti pot cleanses and purifies the sinuses. Because all fluid in our body contains sodium, we should only use lightly salted water in a neti pot. 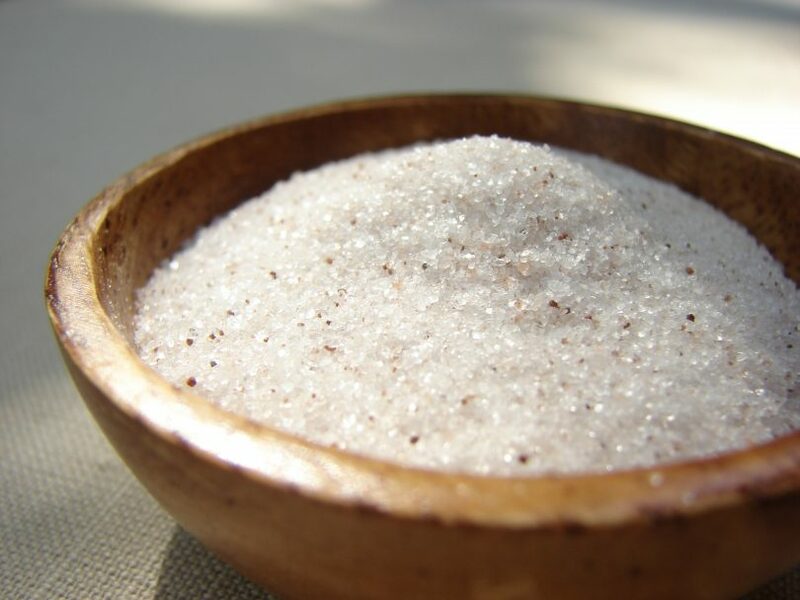 The salt also acts as an antimicrobial agent to ward off sinus infections. Although The Himalayan Institute (the maker of my Neti Pot) recommends using purified sodium chloride, I follow Dr. Mercola’s suggestion and use himalayan salt in my neti pot. I believe the himalayan salt boasts higher integrity and healing properties for nasal irrigation than refined salt. I don’t recommend using a neti pot on a daily basis, because this can strip the native microbes from the sinuses and make you more susceptible to a sinus infection. Instead, I only reach for my neti pot when I face sinus congestion or postnasal drip. Although the idea of flushing my nose with salt water thoroughly intimidated me, I recently began using a neti pot when I have congestion or seasonal allergies. To my surprise, although there is a learning curve, using a neti pot isn’t painful or difficult. If you are a first-time neti potter, I recommend the Himalayan Institute Neti Pot. I appreciated this helpful instructional video to learn how to use the pot. Make sure you use only distilled water or water that has been boiled – do not use straight tap water. For the most powerful detox result, make a himalayan salt “brine” for the bath: use 1-2 pounds of himalayan salt dissolved in a warm bath. I actually make my occasional brine baths with Real Salt because it has all the benefit and a much more comfortable price tag. Trust me, a salt brine bath is INTENSE detoxing. I don’t recommend making the water very hot, it should be pleasantly warm. And don’t stay in the bath longer than 15 or 20 minutes. After “brining” myself in a himalayan salt bath, my muscles feel relaxed to the point of weakness. For a gentler detox and more economical option, add only 1-2 cups of himalayan salt (or Real Salt) to a warm bath. This is the only option on this list that I haven’t tried, but I wanted to include it because I’ve heard good things about it. With that said, I’ve also heard that it does not deliver noticeable results. 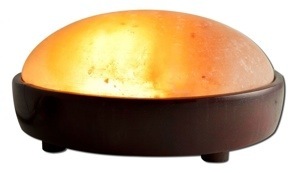 The Himalayan Salt Detoxer uses the same mechanism as my beloved salt lamps. A bulb inside the detoxer warms the himalayan salt dome. Then, you place your feet or hands on the warm dome and allow the generated negative ions to flow into your body. Alternatively, you can purchase himalayan salt slabs, warm them in the oven, and then place your feet on these (less expensive). Fans of the Himalayan claim that it delivers a profound sense of rejuvenation and even a reduction in inflammation. I rely on my earthing mat (I talk about it here) for these results. It works the same way, generating negative ions that flow into the body when you touch the mat. Earthing has been shown to reduce inflammation and cortisol levels. If you have a Himalayan Salt Detoxer, I would be very interested to hear your opinion of it in the comments. Want the simplest way to enjoy the health benefits of himalayan salt? 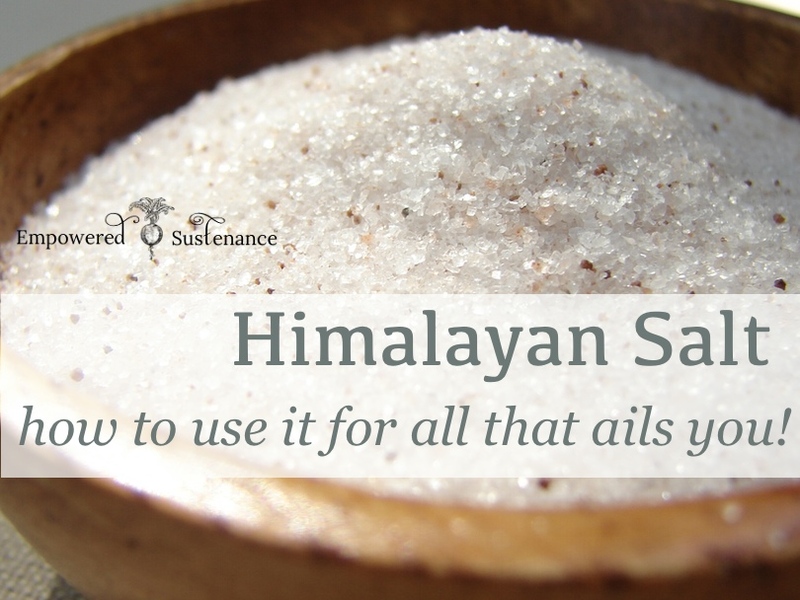 Just swap himalayan salt for the refined stuff in your salt shaker! Misinformed dietitians warn the public to decrease dietary sodium. Studies tell us that this is dangerous advice, since sodium restriction is associated with increased mortality (1) and insulin resistance (2, 3). Himalayan salt should be freely enjoyed. (If you have kidney disease, however, it is recommended that you work with a health practitioner when increasing salt, unrefined or not.) Salt your food to taste, and maybe a little more! Add a pinch of himalayan salt to all your beverages to improve hydration. My Adaptogenic Sports Drink Recipe uses himalayan salt and a special herb to improve hormone balance and hydration. (Updated) After speaking with an expert at Real Salt, I learned that HimalaSalt is unique because the company is committed to sustainable sourcing. This entails mining without blasting, to prevent any explosive residue in the salt. Additionally, all employees are given a fair trade wage and work under ethical conditions. I will purchase HimalaSalt as my source of Himalayan Salt. You can find it in many health food stores of here from Amazon. To learn how himalayan salt, Real Salt and celtic salt compare, check out my post here. I’ve craved this salt for years. Only this salt. Table salt isn’t the same feeling. I eat one nugget a day, sometimes two. It helps my PTSD symptoms and settles my stomach. It all around makes me feel better. It’s ancient salt and as a Christian it makes sense. It comes from the Middle East, as do olive oils, also very healthy. I drink abit of wine and it helps when combined with liquid to hydrate fast. I just got this for a Christmas present and was also told that I could use this as a face mask solution or for my feet? Is this true? can you use Himalayan salt water in a nebulizer with a compressor? Is there a benefit to puting himalayian salt in a bowl (with or without water) & leave it in your bedroom at night? I have a lamp in another room!